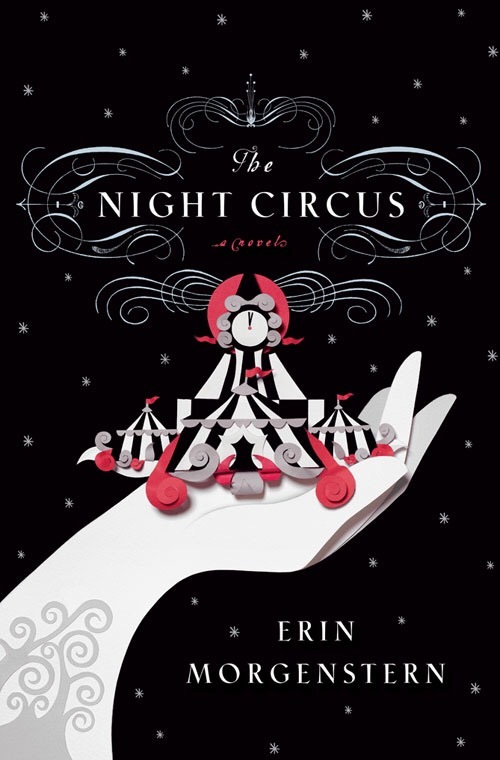 About: The Night Circus is a fiction novel written by Erin Morgenstern. It was published on 9/13/11 by Doubleday, 400 pages. The genres are fantasy, fiction, romance, and historical fiction. This book seems to be the author’s only published book. 1) If you were a part of the circus, what would your part be? Shi: I would be apart of the design. I loved the whole concept of black and white and I do specialize in black and white tattoos so I would love to do that. Jasmine: I want to be the fortune teller. I don’t have any skills in that area but I thought that would be neat to see other people’s future. 2) What would be something you would change about this book if anything? Shi: The pace, the ending, some of the characters. Jasmine: I would change the ending. Add an epilogue to tell what each character is up to 2-5 years later. 3) Did this book meet the expectations you had? Jasmine: No. I was expecting a really good read because I see many 5 stars ratings. 1) How do you feel about the ending? Jasmine: I feel unsatisfied. Why Bailey and what makes him unique? What is Widget’s intention with the man in the grey suit’s story? I feel like the ending is left open for book two. Shi: I personally wasn’t a fan of the ending. 2) Do you know anything about this book before you decide to read it? Jasmine: I have seen reviews of this book by other bloggers and the ratings were good. I also love the cover too. Shi: I heard that it was good a book I had seen many people talking about and loving it. 3) Who is your favorite character? Jasmine: I like Celia. Her magic show is awesome. Even when she was 5 and the magic she does with the tea cup. I was drawn immediately to her and curious to find out more about her. I also like that she loves to read a lot of books and her room is filled up with books everywhere. We can all relate to that. My Experience: I started reading The Night Circus on 1/10/17 and finished it on 1/16/17. I am happy to have the opportunity to buddy read this book with a fellow blogger Shi @ BookwormInkk. Please click on her blog name to read her review of this book. I like reading this book. The circus sounds so magical and I am desperate to visit one soon. The author writes very well and I really like her descriptions and world building. The characters are all very likable and unique. I like the magic and illusions in this book. This book is organized into 5 parts. I love part 3 and 4 the most. The first two parts were slow and I couldn’t connect any of the characters and what is really going on. Us readers will feel as lost as the two main characters, Celia and Marco, where they know that they need to study and practice to prepare for a game but they don’t know who their opponent is or what the rules composed of. The suspense drives me crazy but not to the point of putting down the book. The author’s way of writing is good in this case where she makes you ache to know what’s going on that all you can do is turn to the next page and read on. My attention was on this book all the time. It makes me curious about the man in the grey suit. I made the mistake of not paying attention to the date at the beginning of each chapter and I got confused for a bit. Once I start to get the hang of the date, I understand the story more. I really like Celia in this book. She does awesome magic. I also like Poppy and Widget, especially Widget’s bottles and stories. Too bad the story didn’t expand Poppy’s feelings for Bailey. I like Bailey too, even though I don’t quite know how he can be involved in the circus and if he will be immortal like the others. I guess the author leave that up to us readers to our own interpretation. The plot is good. I’m not sure if I like the ending much, part 5 seems to leave readers contemplating. I guess I’m unsatisfied because I don’t know what will become of the people in the circus and the circus. I need an epilogue chapter for this book. I want to read this! I don’t know how you are able to read so many books, lol! I gotta have my sleep! I needs it! Lol. I do too.. I feel regret as soon as my headache comes. I also sacrifice blog hopping. Can’t really do all..
You actually like endings where you fill in your own epilogues? haha.. well, that’s good. I guess I’m a lazy reader, I want someone to fill in the endings for me haha..
I’ve actually never been to circus so I wish one would come to my town. You can look up Garden Bros Circus. I see their schedule on the website with many cities and states listed. I think there’s another circus called Ringling Bros Circus. You live in USA right? You probably can find one in your state. Yep, I live in the US. I’ll definitely have to search both up 😊. Although, I think the Ringling Bros Circus is doing their final show soon and shutting down. I remember seeing an article about it somewhere a little while back. Catch them before they go 😊 Garden Bros Circus is the one coming to my city and I noticed the tickets are less expensive than Ringling Bros but I guess because it’s smaller. Ohh, I really want to read this book. From your cons, I wonder what I’ll think about the end (I have to admit I skippedyour question about the end to avoid any spoilers), but the other con, slow start and world building maybe won’t be a con in my case. Someties I like slow start, but I just don’t like when it’s dragging (like in Roseblood – that one was so not my cup of tea, I already donated my copy). You may love it and when I think about it, I do really like it because the narration is so captivating. It makes you want to read on. I’m just a bit impatient so I can’t handle the slow start. Also pay attention on the date at the beginning of each chapter when you read. I got confused because I didn’t. My 4 stars means I still love it. Just don’t read the books I rated 3 stars haha I see many giveaways for Roseblood I don’t even care to join. I don’t like it either. You could have hosted a twitter giveaway, like Stephanie @ TeacherofYA really wanted to read it. Thanks for the advice. I’ll know what to pay attention to. Yes, I was thinking about hosting twitter giveaway, but I decided against it bc of postage. It cheaper for me to buy someone a new book from TBD then to send one on my own. That’s why I donated it to my local library – it doesn’t cost me anythinga nd there are still people who would read it, bc we don’t have many books in English, and have more people who actually want to read in English. If you have the patience to find out what’s going on then yes, I would recommend the read. This book is full of suspense, which is good but I need a little hint along the way! haha..
I’m so sorry you didn’t enjoy the ending, Jasmine! Personally, i thought the ending was perfect. It gave me just enough information and left the circus as a mystery. I didn’t want that spoiled! I also loved Celia- she is a wonderful character. What were you expecting from this book which you didn’t get? I guess I enjoy the wrap up more than a mystery haha.. The writing is very captivating, but it just goes on and on. It doesn’t reveal anything until part 3. The man in the grey suit seems so mysterious, hardly any word from him. I was hoping for a little background on him. Marco, how did he ended up as an orphan? Did his parents possess any gifts? I don’t like loose ends or mystery as you called it.. haha..
That’s fair! Sometimes, it just nice to have all the answers and everything wrapped up. I finally gave up on this one. I so wanted to enjoy it, as it sounded like it had so much potential and kept coming up as a comparison to other titles I enjoyed. I just couldn’t get into it. I’m glad you stuck with it and found some things to love! I think I came across it at the same time as Book of Speculation, which I thought it was weirdly wonderful. And probably just because of the circus element, I’ve seen it mentioned with Water for Elephants, a brilliant historical fiction. I read a lot of both upscale/literary fiction with a preference for historical, as well as Science fiction/dystopia so I love when the strange is blended with beautiful writing. I really had high expectations for Night Circus. Unsatisfying ending… That seems to be the case with a lot of hyped books nowadays! What’s going on? Still, great review, Jasmine 🙂 I now know what I should expect when I finally get to read it! Buddy reads are the best! Especially when the feelings about the book coincide hah Great reviews! Although I was sad to read that it didn’t meet your expectations Totally loved the book. Yes, I did! In my case I think the characters made me love it so much. I don’t quiet like the stories where everything is too easy for the protagonists and these ones had quiet a few struggles to go through. I read it about two years ago and honestly don’t remember everything about the plot. BUT I do remember that I was very excited about it and impatient to read more and more and more. Yes, I was impatient to find out what happened too and it just takes too long to reveal haha..
No hehe.. do you do that? I don’t know why I cannot access your blog from the link on the comment. Can you send me a link in this comment? Great 👍 and beautifully portrayed and so well described as always Jasmine. Thanks Kamal. Have you read this book yet? Not yet but will do so very shortly. Jasmine if u could read the poem I have kept on my blog today and give your wonderful feedback it would be lovely. Do let me know how I have written.